Kenyan science teacher Peter Tabichi recently won the world's best teacher award for his works in a school deprived of basic resources. 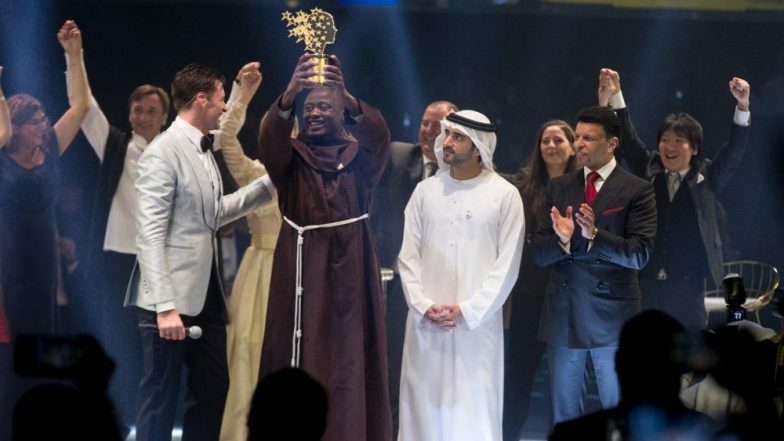 Peter Tabichi, a member of the Franciscan religious order, won the 2019 Global Teacher Prize at a grand event in Dubai on Sunday. On receiving the prize, Tabichi said the prize showed that "teachers matter" and that "teaching is a noble profession". Actor Hugh Jackman awarded the prize to Tabichi at the Atlantis in Dubai. The prize money includes USD 1 million which will be given over a period of 10 years. Tabichi who works at the Keriko Mixed Day Secondary School in Pwani Village, Nakuru said that he wants pupils to see "science is the way to go" for their futures. The award recognises the teacher's "exceptional" commitment towards poor pupils in a remote part of Kenya's Rift Valley. According to BBC, he gives away, 80 percent of his salary to support students. Teachers' Day 2018: How Teachers Build Foundation of Student's Lives That Go Unnoticed. The 36-year-old teacher said that there is a lot of potential in Africa and they should be given a chance to prove them. He said, "As a teacher working on the front line I have seen the promise of its young people - their curiosity, talent, their intelligence, their belief. Africa's young people will no longer be held back by low expectations. Africa will produce scientists, engineers, entrepreneurs whose names will be one day famous in every corner of the world. And girls will be a huge part of this story." Turkish Airlines' Pilot Surprises His Teacher Who Was Flying With Him; Watch Heartwarming Video. Students of his school's science club now compete in national and international competitions. The mathematical science team qualified to compete the INTEL International Science and Engineering Fair this year in Arizona. His students also won an award from the Royal Society of Chemistry after using local plant life to generate electricity. Tabichi was chosen for the award run by the Varkey Foundation, among 10,000 nominations from 179 countries. He is a Franciscan friar who is a member of the Catholic religious order founded in the 13th Century by St Francis of Assisi. The founder of the prize, Sunny Varkey, said he hopes Brother Peter's story "will inspire those looking to enter the teaching profession and shine a powerful spotlight on the incredible work teachers do all over Kenya and throughout the world every day".